Home » Our Doctors » Irene Koga, O.D. Dr. Irene Koga was born and raised in San Francisco. She graduated from the University of California, Berkeley with a BA in Biology and then returned to her Alma Mater and graduated from the School of Optometry. She has been in Optometric practice for over 25 years. Her practice provides general optometry and she has a special interest in Contact Lenses. 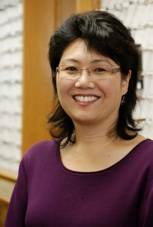 Membership with the California Optometric Association and the American Optometric Association provides Dr. Koga with continuing education opportunities. While not at the office, she enjoys participating in line dancing through out the Bay Area, motorcycling outings with her husband and friends, hiking and reading.